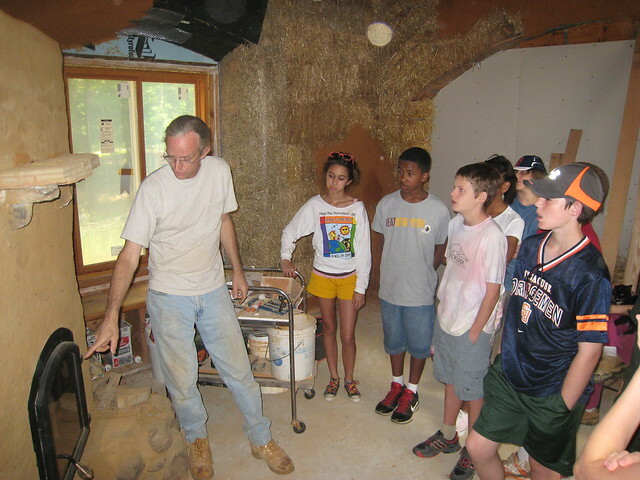 In early June, 2011, the seventh grade science class from Capitol Hill Day School came for a visit and tour. 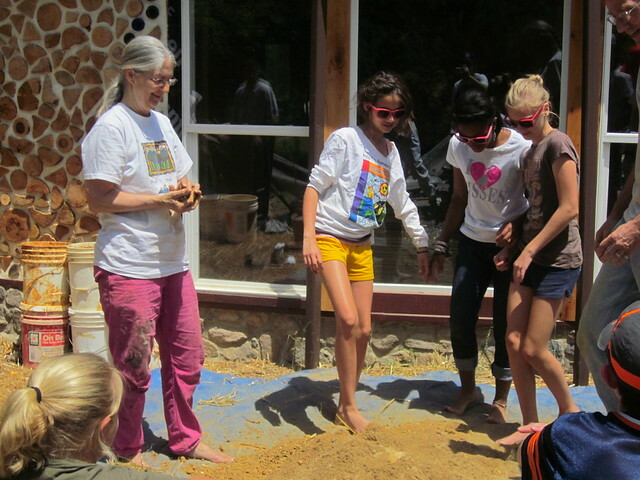 We don't have many photos of the tour, but the cob mixing and earth roof work is what the students will probably remember anyway! Scot explains the efficiency of the masonry stove. 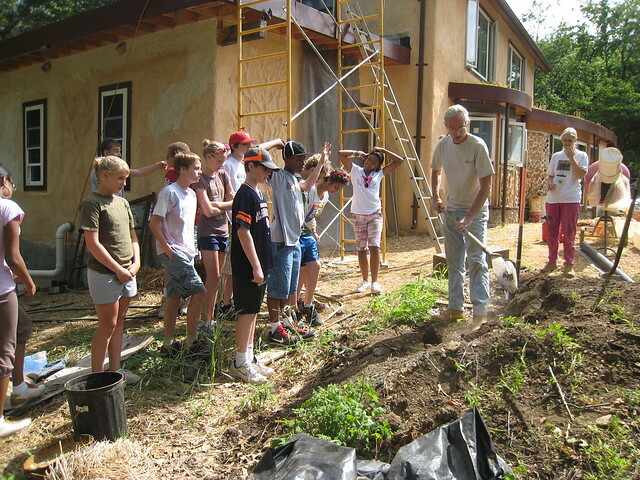 After a fairly long tour and lots of questions about insulation, thermal mass, electric setup, etc, we had the 7th graders haul about 40-50 buckets of compost onto the last big earth roof. We had previously set up a scaffold and pulley system. 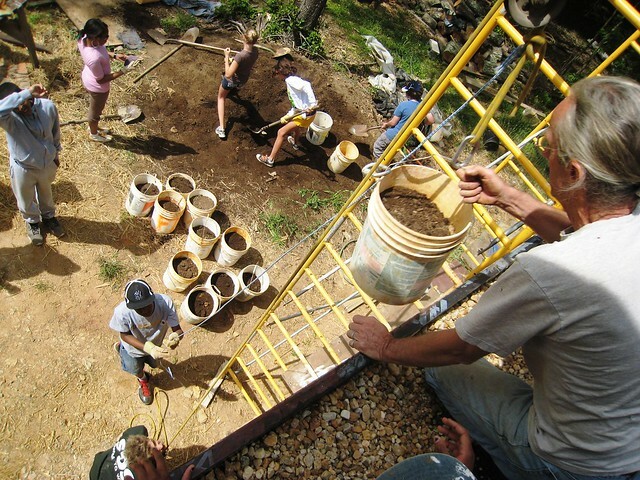 Students loaded buckets, then pulled from below while others took the buckets and distributed the compost around the roof. Lots got done! Using the pulley to haul compost up. View from the top of the pulley system. The scaffold simply holds a horizontal ladder which in turn holds the large pulley. 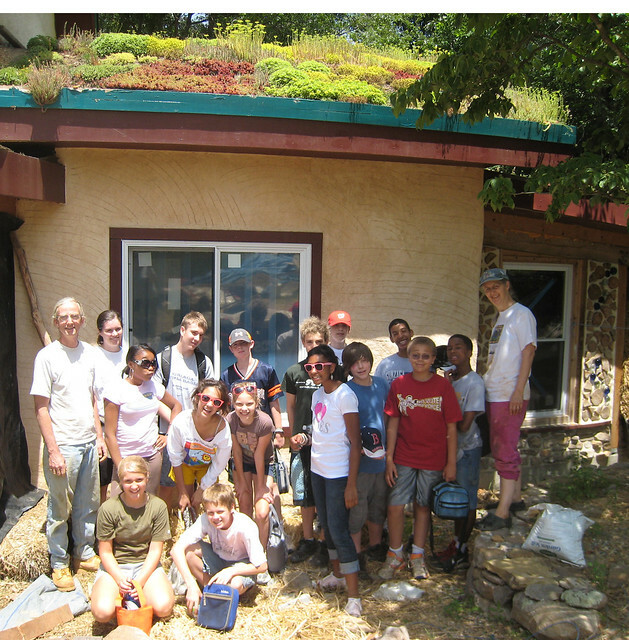 Once up on the roof, students distributed the compost. Plants are there from a previous planting. They acted like it was a lot of work, but they had a lot of fun, too. 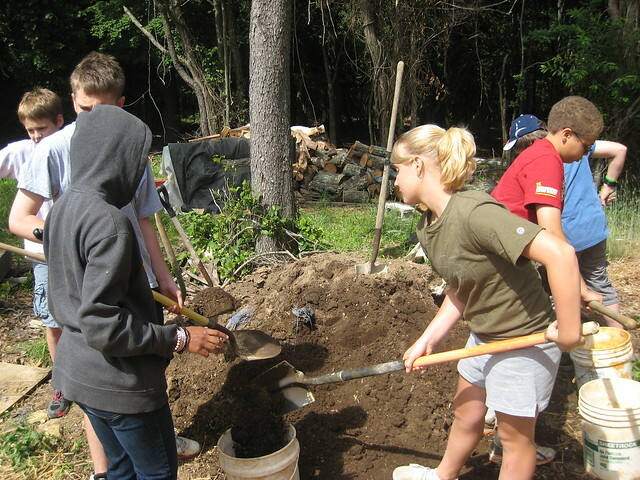 After lunch we mixed some cob with our feet and built some supports for a small bench in the entry way. 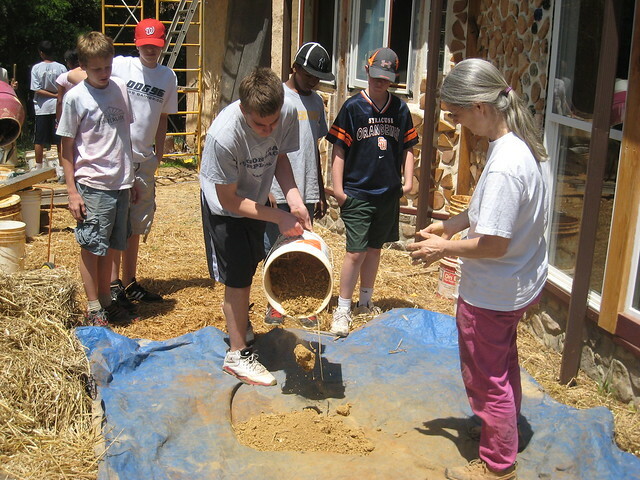 Here some boys add sand and clay. There is method to it. Linda instructs. Boys and girls mixed with their feet. The students enjoyed mixing. Lots of water and mud! At the end of the day we got a group shot under the living room earth roof. Second and Final coats of interior plaster walls. 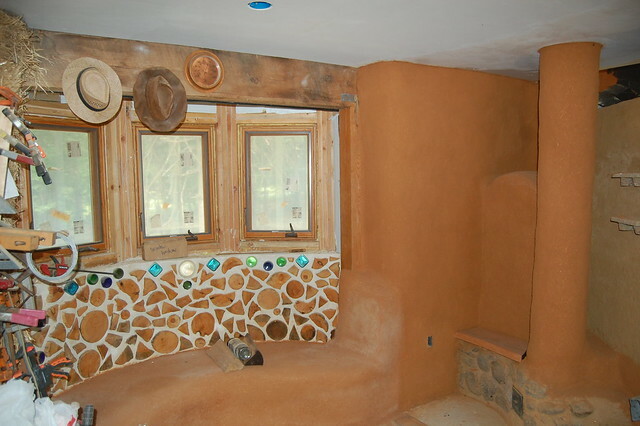 Above, the dining room area with cordwood, cob bench, the dining room wall, plastered stove pipe, and stone work around the base of the masonry stove. 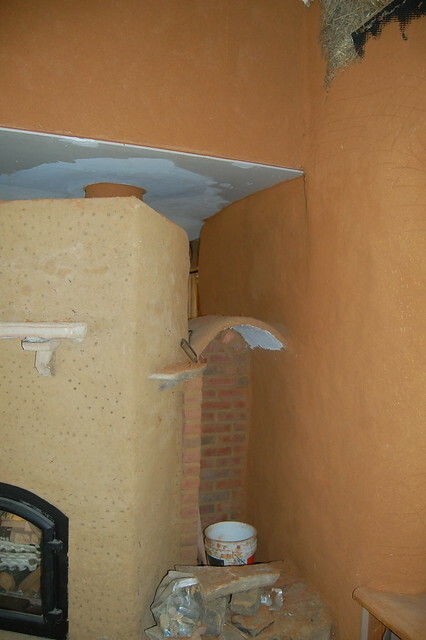 Same as above, but showing the first, rough coat of clay around the masonry stove. Farther around the stove, we built a wood storage area. 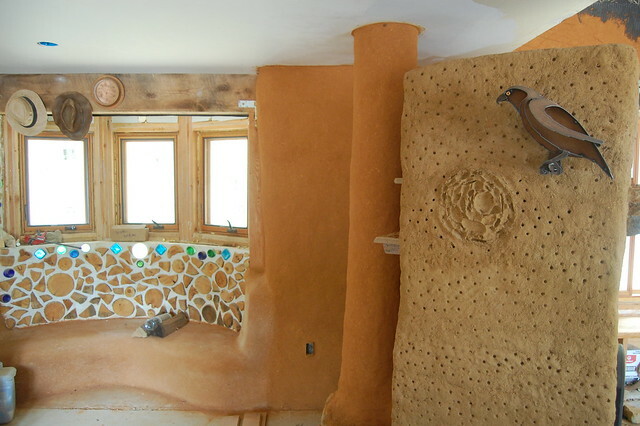 Here we built an arch over that area, a visual link to the arch in the living room, the arch of the barrel roof, the curve of the entry wall, etc. Note the straw at the top. This is one of the few areas without an initial clay coat yet. 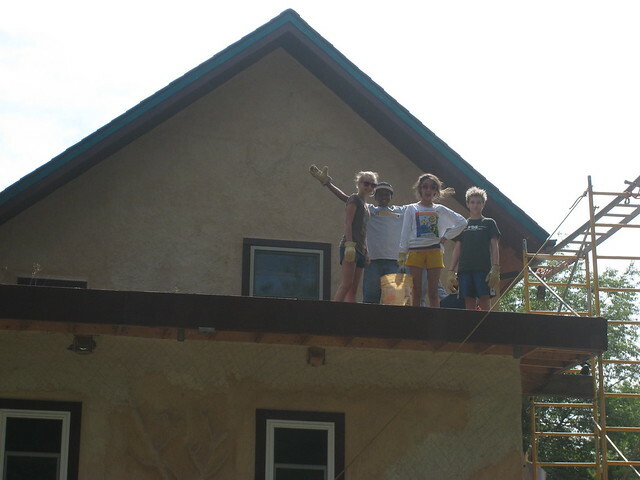 Once we detailed the curve of a straw bale wall as we wanted it, we put the final layer on. In this case, we used a white clay that was donated and added fine, sifted sand, wheat paste, and a green pigment. The result does not show well in the photos, but is a wonderful green that stops the flaking sand coming loose from the earlier layers. 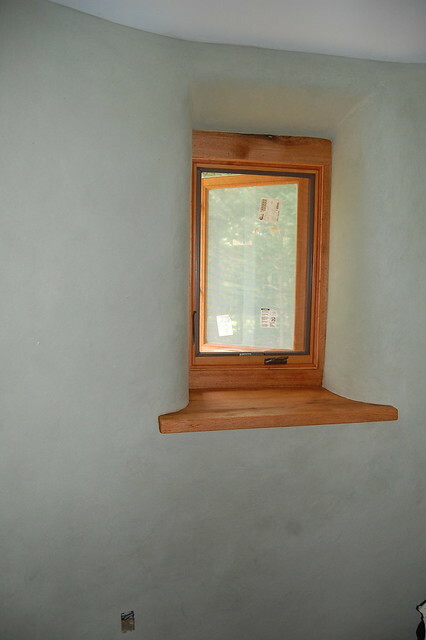 Here you see a window in the bedroom with window trim, an oak window seat, and the final plaster coat. 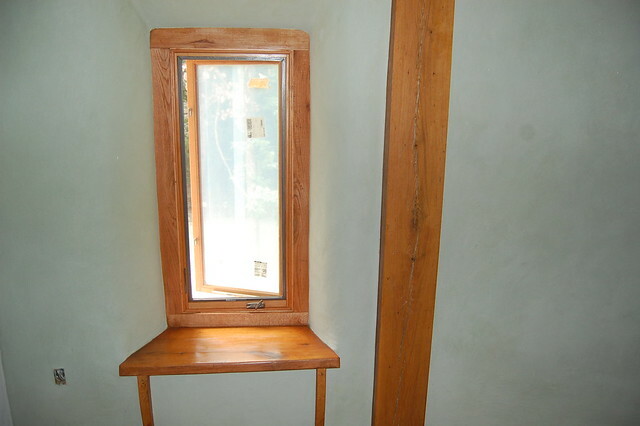 A closer shot of a window with a deep, oak window sill. Plaster is final coat. 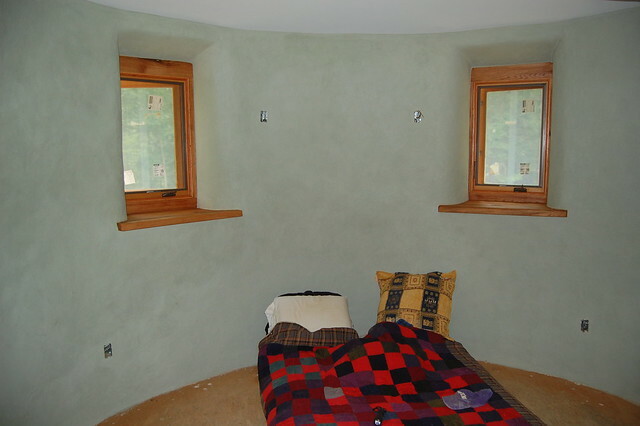 As noted, the walls are greener in life than they appear in these photos.